Ovarian tumors are divided into five histological subtypes: insular, trabecular, stromal, mucinous and mixed, of which ovarian carcinoids are very rare representing < 0.1% of all ovarian neoplasms., Of all these varieties, insular type is the most common type and strumal variety is the least common. Primary carcinoid tumors are associated with symptoms of carcinoid syndrome. Here, we report the case of a postmenopausal female who presented with a history of abdominal discomfort and diagnosed with primary carcinoid of ovary and DOTANOC positron emission tomography-computed tomography scan (PET-CT) scan helping in the final diagnosis. A postmenopausal, diabetic, and hypertensive female presented with a history of abdominal pain from the last 2 months, CT scan whole abdomen was suggestive of the right adnexal mass, and CA-125 was 277.9 U/ml. Thus, raising suspicion of carcinoma ovary and fludeoxyglucose (FDG) PET-CT scan was advised. FDG PET-CT scan showed faint FDG uptake in the right adnexa [Figure 1]a. On further investigation, her ECHO showed severe tricuspid regurgitation and raising suspicion of carcinoid syndrome, and subsequently, the patient was referred for DOTANOC PET-CT scan. This scan showed DOTA-avid solid cystic lesions in the right adnexal region [Figure 1]b and other DOTA-avid lesions in the left femur. CT-guided biopsy from this right adnexa lesion was done and histopathological report confirmed diagnosis of primary ovarian carcinoid. 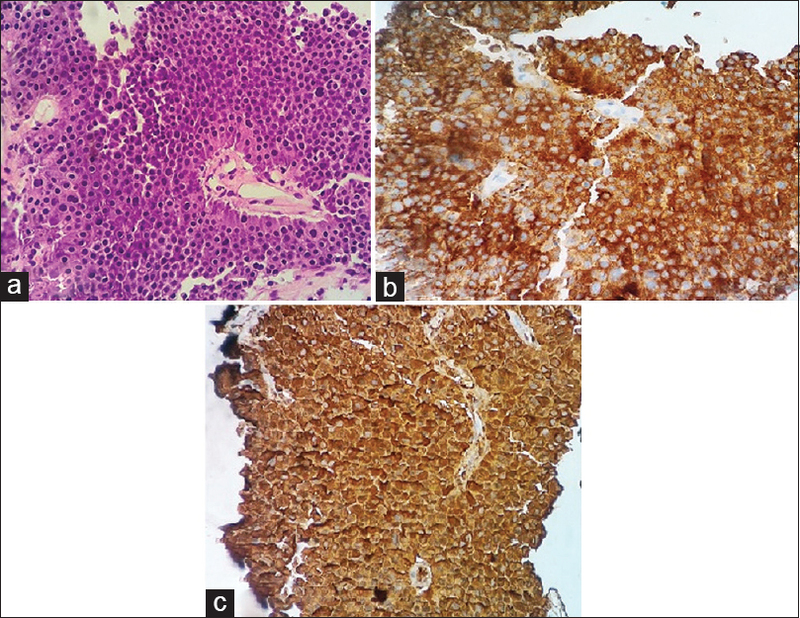 Microscopic examination indicated tissue cores with infiltration by nests and sheets of monomorphic cells with well-defined eosinophilic cytoplasm [Figure 2]a; immunohistochemistry (IHC) report showed strong immunoreactivity to chromogranin [Figure 2]b and synaptophysin [Figure 2]c. Thus, diagnosis of metastatic carcinoid syndrome was confirmed and the patient was started on injection Sandostatin. We report this case due to low incidence of this tumor, thus making its diagnosis less likely. They more commonly affect postmenopausal women with median age of presentation of 55 years. The primary ovarian carcinoids are usually unilateral disease and bilateral involvement is very rare or is suggestive of spread within the peritoneal cavity, more commonly seen in carcinoid of the gastrointestinal tract. In the present case report, low-grade FDG uptake in primary lesion and finding of tricuspid regurgitation on ECHO raised suspicion of this rare entity and DOTANOC PET-CT scan helped in final diagnosis, thus highlighting the importance of this scan. First description of ovarian carcinoid tumors was given in 1939 by Stewart et al. Since then, few case reports have been published about the same. Carcinoid tumors secrete various substances such as serotonin, histamine, and prostaglandins. Excess of these substances can lead to flushing and diarrhea-like symptoms. Usually, these substances are detoxified by liver in intestinal carcinoid but functioning primary ovarian carcinoid tumors can cause these symptoms directly, as their venous drainage bypasses the portal venous system, other symptoms can be of carcinoid of heart-like tricuspid insufficiency and pulmonary stenosis, which were seen in our patient. Synaptophysin and chromogranin are the markers in IHC for the diagnosis of carcinoid tumors. Ga-68 DOTA peptides have high affinity for somatostatin receptor (SSTR). Since majority of carcinoids express SSTR, DOTA peptides can be used to visualize these tumors in vivo. Thus, in case of carcinoid symptoms or high clinical suspicion, DOTA PET-CT scan can be helpful in diagnosis of these rare tumors. As in the present case, DOTA PET scan helped in diagnosis and management of this rare disease by demonstrating DOTA-avid primary lesion and by highlighting metastatic site. Therefore, in case of high clinical suspicion, DOTA scan can be done in guiding clinician for accurate diagnosis. Modlin IM, Lye KD, Kidd M. A 5-decade analysis of 13,715 carcinoid tumors. Cancer 2003;97:934-59. Davis KP, Hartmann LK, Keeney GL, Shapiro H. Primary ovarian carcinoid tumors. Gynecol Oncol 1996;61:259-65. Dotto J, Mezzetti T, Hui P. Primary or secondary? Genotyping confirmation of an ovarian primary carcinoid tumor. Int J Gynecol Pathol 2008;27:33-6. Müngen E, Ertekin AA, Yergök YZ, Ergür AR, Baloğlu H. Primary mixed trabecular and insular carcinoid tumor of the ovary: A case report. Acta Obstet Gynecol Scand 1997;76:279-81. Stewart MJ, Willis RA, De Saram GS. Argentaffine carcinoma (carcinoid tumour) arising in ovarian teratomas; a report of two cases. J Pathol Bacteriol 1939;49:207-12. Metwally IH, Elalfy AF, Awny S, Elzahaby IA, Abdelghani RM. Primary ovarian carcinoid: A report of two cases and a decade registry. J Egypt Natl Canc Inst 2016;28:267-75. Sporrong B, Falkmer S, Robboy SJ, Alumets J, Håkanson R, Ljungberg O, et al. Neurohormonal peptides in ovarian carcinoids: An immunohistochemical study of 81 primary carcinoids and of intraovarian metastases from six mid-gut carcinoids. Cancer 1982;49:68-74. Robboy SJ, Norris HJ, Scully RE. Insular carcinoid primary in the ovary. A clinicopathologic analysis of 48 cases. Cancer 1975;36:404-18.